Newly redesigned with an extra-large oil reservoir, the Mustang Model 25 2-Stage Hand Pump is ideal for use with the “H” Series multiple cylinder squeeze tools. The 2-Stage design allows for a rapid advancement of the squeeze tool upper jaw by using the color coded large piston. Once the pipe is contacted and pumping resistance builds, a simple switch to the smaller piston completes the squeeze-off with reasonable effort. 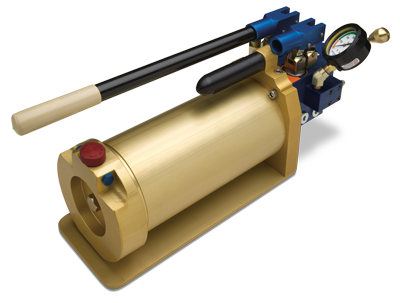 An extra-high capacity oil reservoir and built-in pressure relief valve complete the unit.